Here at C L Promotions we have an extensive range of personalised promotional items which includes our Personalised leather shoe bag. This is a quality leather product which will always keep golf shoes or football boots in prestine condition. 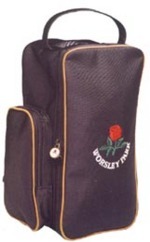 Other promotional and personalised products similar to our personalised shoe bag click here. To find out more about our personalised shoe bags by clicking here and fill in the contact form and we'll get straight back to you. Call us anytime on 01989 780727 and we'll be happy to offer any advice we can. We do a huge range of different promotional and personalised items besides the personalised leather shoe bag click to view.